Rich and famous, and truly legendary.There’s not much we don’t know about chocolate. We know who discovered it (the Aztecs). We know if we want it, we want it right now (the Cravings). And we know some who confess to an uncontrollable love of it (the Addicts). 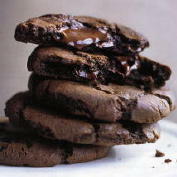 We also know that there are some recipes that showcase chocolate in all of its glory (the Classics). And, some that we just created yesterday (the Sophisticates). Here are a few we can’t live without, those we refer to time and time again when temptation strikes and nothing else will do. Ever since we’ve known Jean-George Vongerichten, he has intrigued us with his imagination and inventiveness. Yet, his recipe we most often make was initially a mistake in his kitchen. It is the famous individual chocolate cake with the warm oooozing center that melts on your plate and causes your heart to flutter. It began as an underdone cake, but has become a classic. 1. Preheat the oven to 355°F. 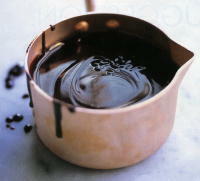 Place the chocolate and butter in a saucepan over low heat and stir until the chocolate is melted and smooth. 2. Place the eggs, yolks and sugar in a bowl and whisk until pale. 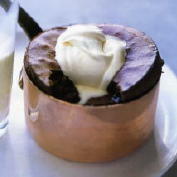 Gently fold in the flour and chocolate mixture and spoon into four lightly buttered 8 ounce capacity ovenproof dishes. Bake for 14-16 minutes or until the puddings are puffed. Meanwhile whip the cream, add sugar and vanilla, whip until softly whipped and fold in the sour cream by hand. 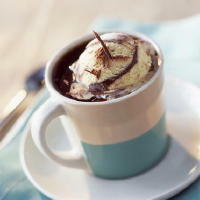 Serve immediately this black and white, hot and cold delight. 1. Preheat the oven to 300°F. Place the chocolate, butter, sugar, ½ cup cream and coffee in a medium saucepan over low heat and stir until the mixture is melted and smooth. Place the eggs and the flour in a bowl and whisk to combine. Slowly whisk the chocolate mixture into the egg mixture and pour into a lightly buttered 3x13x3 inch rectangular loaf pan. 2. Place the baking dish in a deep baking tray and pour in enough boiling water to form a Bain Marie, halfway up the sides of the dish. 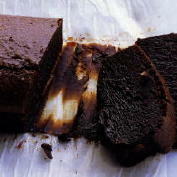 Bake for 2¼ hours or until the chocolate fudge loaf is cooked when tested with a skewer. It will be slightly moist, not dry like a cake. Place the dish into the fridge and allow cooling completely, 4-6 hours. Invert the fudge loaf onto a plate and slice to serve with a dollop of softly whipped cream, slightly sweetened, flavored with vanilla and with sour cream folded in. Addictive. 4. Spoon the batter onto the baking sheets in 1" evenly spaced mounds and bake for 12-15 minutes until the tops are glossy and lightly cracked; shift the pans from front to back and top to bottom halfway through to ensure even baking. Slide the parchment paper (with the cookies) onto 2 wire racks. Let cookies cool completely, and store in an airtight container for up to 3 days, if they all haven’t disappeared. Were mad for dark, rich chocolate. It seems just about everyone we like is. Chocolate shops and new artisanal chocolate makers have blossomed across the country and around the world to meet this passion. There are clubs, societies, and cookbooks extolling the virtues and complexities of chocolate. The amount of liquor in a chocolate has become a debate, the percentage of cocoa content you crave, a measure of sophistication. Once again it all amounts to adventurously tasting and eventually selecting your own favorites. Your own taste, that’s all that’s important. We prefer dark chocolate, the darker the better. We generally use dark chocolate in the 62-64 percent range in our cooking, but the percentages can soar to 70, 82 or, if we’re feeling daring, even the 99 percent range. The higher the percentage of cocoa beans, the stronger and more intense the chocolate flavor. Our favorites are Valrhona and Barry Callebaut from Europe, Scharffen Berger and Guuittard from San Francisco, and El Rey from Venezuela. We also adore the finely crafted chocolates of Jacques Genin, Debauve & Gallais, Michel Cluizel, and Maison du Chocolate in France; Jacques Torres in New York and Michael Recchiutti in San Francisco. And, there are new artisanal chocolatiers popping up everyday, everywhere. Taste them all. Even the mistakes are sweet. 1. Place the chocolate, cream, honey and butter in a small saucepan over low heat and stir for 4-5 minutes or until the mixture is melted and smooth. Serve immediately. Melted dark chocolate with just a smidgen of milk. A lovely French tradition. Jacques Genin and Angelina’s serve the very best. 1. Heat the milk, melt the chocolate and whisk well. If you have the time, we like to then refrigerate it and reheat later for a thicker Chocolate served piping hot on a snowy day. Or serve it over ice on a hot summer afternoon.